The early morning meals take place on Mondays, Tuesdays, Thursdays, and Fridays. Student meals always include three of the four food groups, with fruits, vegetables, dairy and proteins on the menu. On Wednesdays, Brant Food for Thought hosts a community breakfast. This effort involves an army of community volunteers who start their day preparing a fabulous breakfast for students. These breakfasts include delicious items such as grilled cheese sandwiches, pizza buns, fruit salads, and many other nutritious foods. The school also receives a minimum of 15 packed lunches a day from Child Hunger Brantford, a non-profit organization that promotes healthy food choices and supports the promotion of nutrition in the school. These lunches never go to waste as students are quick to take what they need, and the nutritious meals allow them to focus on school and learning. A staple at the school for the last 25 years has been the milk program for all students. Thanks to a sizeable donation of $30,000 from the estate of the late Ralph Peter Swanson, a former student at Graham Bell-Victoria, students have enjoyed the nutritional boost milk provides for many years. 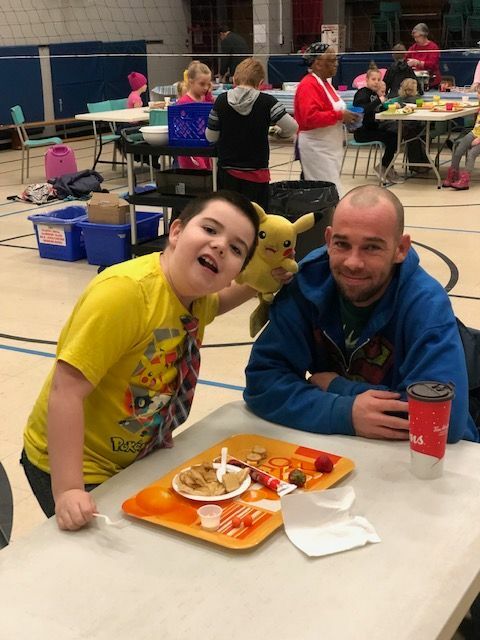 Community is an important part of Grand Erie’s Multi-Year Plan, with a priority on recognizing and celebrating the partners whose contributions enhance the learning experiences of all students.